Magic is in the air at Navy Pier. That’s where Chicago Shakespeare Theater is presenting one of the best-reviewed shows of the fall season. "The Tempest" is Shakespeare’s most magical play, a romantic drama about Prospero, an exiled duke with supernatural powers who seeks to protect his daughter. 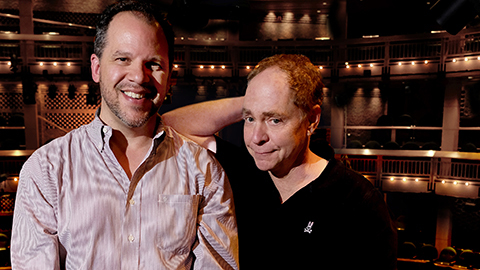 When Chicago Shakespeare wanted to tell the story, they brought in a master of magic – Teller, of Penn and Teller, and a stage full of theatrical tricks. At a rehearsal before opening night, an actor listens as Teller shares a secret of sleight of hand. Teller of course has made a big career as the silent half of Penn and Teller, the highly praised magic duo with a low tolerance for bull. When “Chicago Tonight” visited Chicago Shakespeare, the often quiet magician had a lot to say. Teller Teller: One of the challenges of Shakespeare for a contemporary audience is to make clear all of these ideas that are sometimes realized only in the language, and since the language is hundreds of years old it helps to assist that language with strong visual things. For this show, which is about magic, supporting that with magic that is visual really helps to clarify what’s going on. Brandis Friedman: Teller – that is his full legal name – was introduced to the works of William Shakespeare as a boy growing up in Philadelphia. Teller: “The Tempest” first came on my radar when I was a child, because my grandfather sent my family a set of Shakespeare, and my father, knowing my natural predilections in favor of magical things, pointed out "Macbeth," which is full of witches and supernatural, and “The Tempest,” which is all about a magician. Aaron Posner: The work of magicians, the tools and apparatus and attitudes and perspective of magic are just sort of peppered all through the show, it’s the fabric that we really built the show from. Rick Boynton, Chicago Shakespeare Theater: But the integration of the magic is crucial because it’s not just a magic trick, it’s how it furthers the plot and develops character. BF: In the play, the exiled Duke of Milan attempts to redeem himself and his daughter through trickery and illusions. Teller Teller: This show is all about a person whose means of fighting is [that] he creates hallucinations for other people – that’s how he fights his battles – and in this show, normally that’s represented so you understand that the character must be seeing this [raises hand] at this time, we’re trying to make it so that you the audience are experiencing the same impossible, amazing, awe-inspiring and frightening events that are spooking out the characters in the show. BF: The production takes place in a traveling tent-show during the Dust Bowl era. It features songs from Tom Waits’ catalogue and a creature created by the dance company Pilobolus. Aaron Posner AP: There are many Shakespeare plays in which less is more, that something spare and barebones can be really wonderful. I think “The Tempest” is a play where more is more [laughs] and so magic and music and really dynamic and exciting movement and of course great acting and great poetry – which is already there – so we’ve really tried to make this a kind of big tent production of “The Tempest” with a lot of things going on in a lot of different ways. BF: Posner and Teller have staged “The Tempest” before, but never on this scale and never on a thrust stage that extends into the audience on three sides, which makes the magic all the more mind-boggling. Teller: The previous places we’ve played have been proscenium houses where you’re looking at the stage like a picture. In this thing it jumps right out at you, so it projects into three dimensions like it never has before. What gives magic its edge is that it’s not a comfortable form to watch. You don’t just sit back and let magic wash over you because it’s seriously contradicting all your experience, so what you see is coming into collision with what you know and there’s a sort of explosion that’s very exciting, but it also jars you out of your seat. You don’t watch a magic event like this [strikes a relaxed pose] you watch it on the edge because you’re watching both as a complicit participant and as somebody who’s trying to catch it out, and the excitement of that tension gives it a whole different way to watch a show. BF: Following our interview, Teller left town for a weekend of performances in Las Vegas with Penn and Teller. We asked him what he looks for in a collaborator. Teller: I look for someone with whom I can disagree. I don’t think you should be trying to find a partner who thinks like you. You should be trying to find an artistic partner who thinks unlike you. BF: Teller’s current part-time partner couldn’t hide his enthusiasm for the creative team they’ve set in place. AP: These are people who are at the top of their game in all these different fields, coming together to try and make a “Tempest” that no one has ever seen before. Our goal is lofty, right? We want to do the best “Tempest” anyone’s ever imagined. That’s our goal. We’ll see how far we get. Performances of “The Tempest” at Chicago Shakespeare Theater continue through Nov. 8. Get information on tickets, dates and directions here.